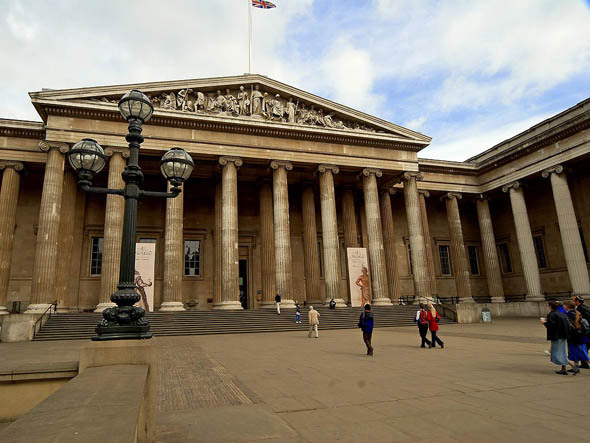 The core of today’s British Museum, including the great south front, was designed in 1823 by Sir Robert Smirke (1780-1867) in Greek Revival style, but not completed until 1852. Its construction was prompted by King George IV’s gift to the nation of his father’s library, known since as the King’s Library. The new building was a quadrangle, built in the garden to the north of Montagu House. The southern wing eventually replaced the old building. Robert Smirke withdrew from the work in 1845, handing over completion of the project to his younger brother Sydney who was responsible for the Front Hall, the completion of the main (central) section of the south front and colonnade, the forecourt and the railings. In 1852 the proposal was put forward that Robert Smirke’s empty quadrangle be occupied by a new building to house the library. Sydney Smirke (1798-1877) was the architect. Work on the construction of the Reading Room, a circular domed reading area surrounded by rectangular bookstacks, took place in 1854-7. 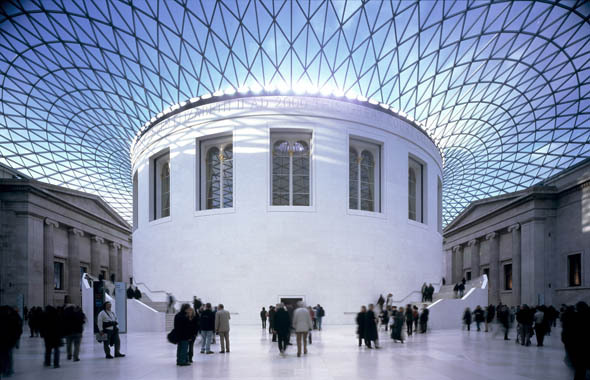 The Queen Elizabeth II Great Court, designed by architect Lord Foster, was opened by Her Majesty the Queen on 6 December 2000. Following the departure to St Pancras of the British Library, the bookstacks surrounding Sydney Smirke’s round Reading Room were dismantled and a new floor constructed across the courtyard. This was then roofed over to provide the largest covered square in Europe.